This past week, it’s been everything elderflower around here. The weekend prior we visited friends who live outside of Paris and spent a lot of time wandering around their garden, which always makes me reconsider whether I am actually a true city boy. I love being walking distance to almost whatever one could want, which you can do in a city but then again, I wonder what life would be like to wake up to the sounds of birds singing outside my window, plucking my own radishes from the garden, grilling dinner (and lunch), and enjoying a glass of wine with friends in my backyard, putting my feet up and not worrying about all those people stressing out on the subway or métro. Or listening to a gazillion cell phone conversations while trying to enjoy a seat at a café, or a quiet moment in the park. In the meantime, I’ve been rapturously enjoying the elderflowers from my friend’s tree. It was leaning up against their garage and I know you’re not supposed to rip off the flower heads off elderflower trees as the tree won’t regenerate the flowers the next time properly (or something like that), but when they said they had a few branches they wanted lopped off anyways, Romain gamely got on their roof with a branch trimmer, and went to town. As the branches fell, I plucked off the flower heads and bagged them up. Halfway through, Romain yelled down, “Ça va, Daveed?” and I said, “Non,” to keep going. So he did. I was thrilled to have a heavy bag of flowers and promised my friend’s a gift from what I was going to make with them. I was excited to be able to do some recipe testing with them for my next book. The hardest thing about being a seasonally based cook and baker, and cookbook author, is that some seasons are pretty short. And not everything is easy to find. (I try not to use very exotic ingredients in recipes in my books, but I think having a few that are interesting to read about, or that fit into the overall story of the book, is worthwhile.) So having a windfall of elderflowers let me take advantage of the window of time to work on some elderflower recipes. Because they’re so precious, you don’t want to have too many duds, which you tend to do when testing recipes. It’s painful to get rid of a chocolate cake because you decide it could use an extra egg, or less flour, but even more painful to toss out something that took two cups of elderflowers to make. A few friends and acquaintances have said over the years that they always wanted to come and test recipes with me, and hang out in the kitchen. So I got in touch with a few of them to help pick the teeny elderflowers from the stems that I had in my giant bag. Same with the elderflowers. I spend five hours picking through them all, and my neck is now permanently curved like a question mark. But there’s no question that it was worth it when I tasted my first spoonful of this absolutely divine Elderflower Sorbet. It’s right up there with handmade dim sum, as one of the best things you’ll eat. I wanted to share it asap, and plan on enjoying it with a splash of Champagne or sparkling wine poured over it. But it’s really a treat just on its own, too. The wine in the sorbet helps keep it from freezing too hard. If you want to omit it, you’ll probably need to take the sorbet out of the freezer several minutes in advance before scooping.I tried it with both amounts of sugar (sugar also helps keep things from freezing too hard) and preferred the flavor with 3/4 cup, although you’re welcome to use either. 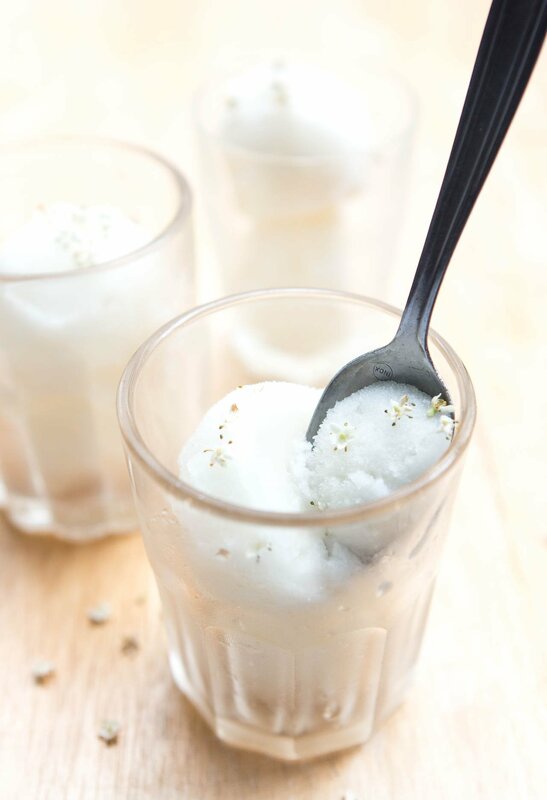 For more information, check out my post, Tips for Making Homemade Ice Cream SofterI’ve not used dried elderflowers (which I just learned about), but if you try it with them, let us know how it turns out in the comments. 1. Heat water and sugar over low heat in a medium saucepan, stirring until the sugar is dissolved. Remove from heat and add the elderflowers. Cover and let steep for at least 4 hours, but preferably overnight. 2. Strain the mixture through a fine mesh strainer, pressing the flowers with the back of a soup spoon to extract as much flavor from them as possible. Add the lemon juice and white wine. Chill the mixture thoroughly, then freeze in your ice cream maker according to the manufacturer’s instructions. Made with Lickit® ©All rights reserved.